The CZ P-01 is a compact, aluminum-framed 9mm designed for LE and Military duty, but its compact size and the reduced weight due to its forged alloy frame make it ideal for discrete carry as well. Equipped with a decocker, the P-01 provides convenience for those who prefer hammer-down carry. With a heavy first-round trigger pull, any additional shots are a light, crisp single action. 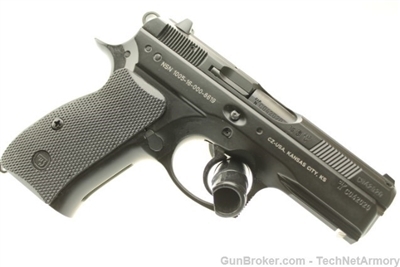 The P-01 was the first CZ model to benefit from updated manufacturing technology at CZ’s Uhersky Brod factory. Since the time of its introduction (designed in 2001, NATO-approved in 2003) the production upgrades have been rolled out to the rest of the CZ 75 family and several new rifle models as well. These upgrades mean the components of the P-01/P-06 are completely interchangeable with every other P-01/P-06, with no individual fitting needed. This required some very careful re-design so that the reliability and accuracy were not impaired. With an integral 1913 accessory rail on its dust cover, the P-01 easily accepts any of the industry-standard lights and lasers to assist with low-light use. After 3 years of some of the most aggressive small arms testing ever, the CZ P-01 won the honor of replacing the CZ 75s previously used by the Czech National Police. Reliability: The U.S. Army “Mean Rounds Between Failure” (MRBF) requirement is 495 rounds for 9mm pistols. During testing of the CZ P-01, the average number of stoppages was only 7 per 15,000 rounds fired. This is a .05% failure rate or an MRBF of 2142! For many years, the P-01 carried an NSN engraved on its frame, making it the first NATO-spec pistol ever available to the public. Recently, the factory decided to upgrade the slide stop spring which in turn means the current models may or may not carry an NSN.